In addition to opening a brand-new concept in NYC this summer called The Pint Shop, Museum of Ice Cream ice cream will soon be available at Targets around the country. If you haven't snagged that Museum of Ice Cream Instagram post yet, don't worry, you still have time. On Wednesday, the Museum announced its return to NYC with the launch of The Pint Shop, opening in the city's Meatpacking neighborhood on June 6. And the whole thing sounds very, very 'grammable. "The initiative re-envisions the grocery store, enabling a hyper-sensory experience," reads a press release announcing the opening. "At The Pint Shop, visitors will explore life-size pint installations, browse aisles dedicated to Museum of Ice Cream's debut ice cream flavors, and have the opportunity to indulge in a reservation only, one-of-a-kind tasting experience, where participants will learn about the making of ice cream through all five senses." Perhaps the biggest news, however, is that you will soon be able to buy MOIC ice cream at your local Target, along with other Target staples like shampoo, lipsticks you don't need, and competitively priced yogurt. 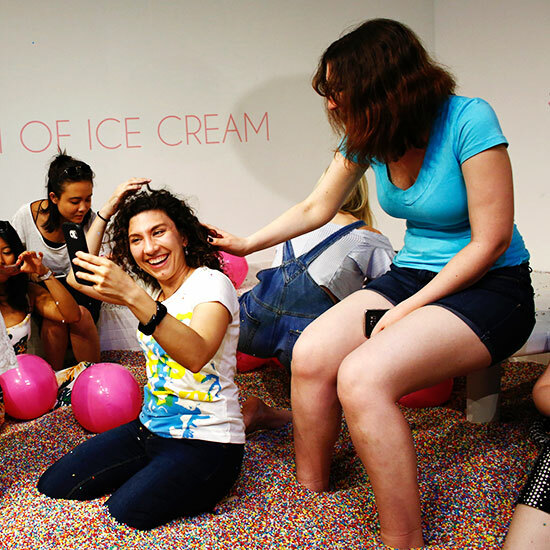 Seeing as the Museum of Ice Cream, which launched in 2016, has only popped in a select few cities (L.A., Miami, San Francisco, and N.Y.C. ), the availability of its debut line of ice creams at Targets around the country is a very big deal. So even if you never got the opportunity to dive into a pool of sprinkles, you can now eat an actual flavor called "Sprinkle Pool," which sounds (almost) as fulfilling. Other flavors in the line include Piñata, as well as new additions like Vanillionaire, Chocolate Crush, Cherrylicious, Churro Churro, and Nana Bread. The Pint Shop will be free and open to the public six days a week, starting June 6, 2018, on a first come, first serve basis.